China is the heart of Asia. The more stable and prosperous China becomes, the more stable and prosperous Asia will become. By 2050, China can be north Asia’s energy nexus, enhancing energy market competition, fostering energy supply innovation increasing regional energy supply security. In so doing, China can play an immensely positive role. To achieve this, China should deepen interconnections between the Chinese electricity grid and neighbors Japan and South Korea across the East China Sea. Doing so would create a ‘positive sum’ geopolitical solution to growing Asia’s economy’s while reducing both territorial tension and carbon emissions through expanded trade. China has a large amount of renewable energy resources ranging from wind (in its north and offshore) to solar energy (its north and west). It also has coal and natural gas. If you look at China’s infrastructure center of gravity with ‘Asia’ as defined by Grenatec, it’s easy to see it orienting toward Shanghai ,Hong Kong and an emerging third place, Southern China. At the same time, however, China is building out economic infrastructure at the most rapid pace of any nation in history. This includes both fossil fuel (mostly coal) and renewable energy generation (mostly wind and solar) infrastructure. The result: energy sources, both present and future, could flow unhindered and in their most efficient form between producers and consumers. For example, biofuel energy from China’s agricultural interior could be transmitted to urban electricity markets either by pipeline for combustion by urban power plants. If those plants are already operating at capacity, as electricity generated from a nearby generator and transmitted to market. The ramifications of such an efficiency revolution are mind-boggling. China is engaged in a massive expansion of country-spanning high-capacity, long distance power lines. This is creating the skeletal framework for a future energy system. At present, China is rolling out High Voltage Direct Current (HVDC) power. Later, China plans to roll out even higher capacity Ultra-High Voltage Direct Current (UHVDC) power line infrastructure. Between now and 2022, China plans to lay as many as 35 HVDC and UHVDC power lines across the nation. This gives China the lead in developing a key technology crucial to the coming global low-emission energy revolution. All of this is part of an estimated $600 billion China plans to spend over the next 10 years (or roughly 1% of GDP) building out what it calls a ‘smart grid’ encompassing both long-distance and local distribution. Meanwhile, China is filling out its natural gas pipeline system through construction of a series of nation-spanning pipelines to import natural gas fro Kazakhstan and Russia. It’s also building out a nationwide fiber optic system known as China Fiber Optic City. All of this offers a unique opportunity to bundle or, at the very least, more deeply integrate, infrastructure. For instance, many HVDC cables today now come with fiber optics embedded for network management. At its most extensive,it could also involve laying natural gas pipelines alongside bundled HVDC/fiber optic cables. Given that most infrastructure traverses similar routes, this is common sense. As new infrastructure comes online, and is coupled with energy market reforms, China’s energy markets should operate with fewer and fewer logistical, economic and administrative impediments. That, in turn, will make China to become a desirable interconnection partner for neighboring countries. China could import low-emission solar energy from Australia, geothermal energy from Indonesia and wind energy from the Mekong States. China could export hydropower, wind, solar and even nuclear power. Regional supply and demand would be balanced through a distance, carbon and scarcity-adjusted price mechanism. Load-balancing would be provided by natural gas and hydro — similarly priced. Over the medium term, China’s country’s electricity consumption growth is so high it’s likely to outstrip the domestic energy industry’s capacity to supply. The result will be disruptive supply shortages (brownouts and blackouts). This hurts economic growth. The key, then, is to develop long-term energy security and market efficiency goals centered around trade, competition and cross-border exchange of supply. China has large wind and solar resources in its windswept northern desert area of Inner Mongolia. These alone would be enough to power the country. Researchers from Harvard University and Tsinghua University estimate China has enough terrestrial wind resources to power the nation several times over. They estimate a network of turbines in northern China operating at 20% capacity could satisfy China’s electricity needs at roughly US 7.6 cents per kilowatt-hour. The investment required would be $900 billion. Spread over 20 years, that’s $45 billion a year. China is now the world’s largest wind market and it has developed plans to build seven ‘wind bases’ in the country by 2020, each with a capacity of 10 GW. By 2020, China has an over arching plan to develop 100,000 MW of wind capacity — an eight-fold increase from 2009. Huge amounts of additional wind energy can be harvested in neighboring wind-swept Mongolia. If developed on a large-scale, Northern Chinese and Mongolian wind resources could be coupled with hydropower and natural gas from Russia’s Far East to offer new supplies of large-scale, diversified energy supplies in northeast Asia. China has strong direct normal radiation resources in its northern regions. However, much of this area lies above 35 degrees north latitude. This makes the lower sun angle problematic for cost-effective generation of concentrating solar power. Even so, a major US solar thermal power company has teamed up with a Chinese power equipment manufacturer to push the limits of concentrating solar power at high latitudes in China. Cailfornia-based eSolar and China Shandong Penglai Electric Power Equipment Manufacturing have agreed to build a 2,000 MW concentrating solar power plant in Yulin, Shanxi Province. If built, the project will be the world’s largest, and also its most northerly, at 38 degrees north. In a separate deal, US thin-film solar PV module developer First Solar Inc. has reached agreement with China Guangdong Nuclear Solar Energy Development Co Ltd to build the world’s largest solar PV production plant. Both of these projects will be important in achieving the kinds of economies of scale needed in solar power to drive down prices. China has been actively in harnessing tidal power for 40 years, and now has 6 MW of capacity installed. The largest single installation is at Jiangxia south of Shanghai, which at 3 MW amounts for roughly half of China’s tidal power output. The Chinese have teamed up with Tidal Electric Co. of the UK to build an ambitious 300 MW tidal plant at the mouth of the Yalu River which borders North Korea. However, not much has been heard of the project since 2004. China now gets about 20% of its electricity from hydro. It now has about 200,000 MW of hydro capacity. Another 70,000 MW is either planned or under construction. Virtually all of it is in southern China. On top of this, China plans to build 80,000 MW of pumped storage hydropower generating capacity from 2011 to 2015, up from a previous goal of 50,000 MW. This 270,000 MW of capacity, coupled with the roughly 30,000 MW now planned for the Mekong, up to 10,000 MW in Borneo and 80,000 MW of pumped storage, represents a huge regional resource. It could provide a huge amount of rapid-response ‘load balancing’ capacity in a collectively-managed Asian electricity market interconnected by low-loss, rapid-transmission High Voltage Direct Current (HVDC) electricity cables. China is building out its natural gas pipeline infrastructure to increase use of natural gas in electricity generation as a replacement for dirty coal. China aims to increase use of natural gas from four to eight percent of overall needs, and renewable energy from 8 to 11%. China’s has large natural gas resources and is building out natural gas pipeline infrastructure to reach them. China is extending its natural gas pipeline system to its northwest gas to its Tarim, Qaidar and Junggar gas fields, as well as for onward interconnection to Kazakhstan to provide for imports from Central Asia. China is also building out natural gas pipeline interconnections with Russia to access Russian Far East natural gas supplies. To the south, it is building out pipelines across Burma to the Indian Ocean to ensure an alternative route to the vulnerable Straits of Malacca for Chinese imports from the Middle East. China’s goal by 2020 is to octuple domestic natural gas consumption from 39 billion cubic meters in 2004 to 200 billion cubic meters in 2020, raising the percentage of its energy use satisfied by clean-burning gas from three to nine percent. As this occurs, China wants to build strategic natural gas supply stocks equal to roughly 25% of annual consumption. It plans to do this by building at least 15 strategic natural gas stockpiles around the country. Four of them, one in Tianjin, two in Jiangsu and one in Hebe province, could be online as early as 2012. All of this is to be welcomed, for two reasons. First, like elsewhere in Asia, natural gas is an ideal transition fuel to a future regional energy economy based upon renewables. It can also play a residual role in the later stages of the transition to renewables by offering ‘load-balancing’ capacity. This well-defined future role enhances investment certainty. Secondly, China’s investment in expanded natural gas pipelines deepens interconnections between regional energy transmission systems, just like fiber optics connected the world’s telecommunications systems during the 1990s. China is also building out strategic oil and gas reserves. By 2020, China aims to have strategic oil reserves of 475 million barrels, which would two-thirds the size of US’s 727 million barrels of strategic reserves. China has built several pumped storage hydro facilities close to its cities, and has plans to build more. This is putting China in the forefront of developing the use of water as a ‘battery’ for providing load-balancing to electricity grids. Pumped hydro stores water behind dams. This water can then be released on short notice to generate electricity. The devastating 2001 Japanese earthquake and tsunami has put China’s massive coastal build out of nuclear power under the safety spotlight. Nuclear power could, over time, satisfy a sizeable amount of China’s base load power needs. But it also leaves China a ‘hostage to fortune’ through increasing nuclear accident risk. China can’t dig up and ship coal quick enough to feed the coal-fired power plants that provide the electricity for its growing economy. At present, much of the coal China uses is shipped to power plants by road and rail, creating congestion in key modes of transport also used for other things. In Central China, a 2,100 MW coal-fired power plant serving the needs of Jiangsu wasn’t built there, but instead next to the coal mine in Shaanxi that produces the coal. The coal-fired power station near the mine then transmits the electricity by a 740-kilometer HVDC cable to Jiangsu. This energy ‘telecommuting’ offers huge opportunities for China to reduce energy transit bottlenecks. More plants like this one can be expected to be built in China in coming years. But regardless of how quickly China runs over the short- to medium-term, the country’s electricity consumption growth is likely to outstrip the domestic energy industry’s capacity to supply. The result will be disruptive supply shortages (brownouts and blackouts), at least over the short- to medium-term. Between now and 2020, China is expected to spend $800 billion dollars lifting the share of renewable energy in the domestic economy. China also plans to impose binding 2020 emissions constraints on its regions. At the same time, China is investing aggressively in both grid expansion and expanding its natural gas pipeline system and fiber optics cables deeper into the hinterlands. However, many green projects are being built before they can be connected to the grid. Meanwhile, many of China’s existing power assets have been forced to operate as a loss due to incomplete market reforms. Nonetheless, as these problems get solved, China’s (and Asia’s) existing coal-fired power capacity can be progressively relegated to contingency use. This would help insulate both China and its trading partners against economically-damaging electricity supply shortages. Indeed, China’s surplus-but-idle coal-fired power capacity could offer a supply cushion for all of Asia. This would prove handy in the event of a regional energy supply shock such as an earthquake in Japan. China is a huge market. It could import and export power over the long term. At present, a big problem is that half-baked reforms that are jeopardizing the profitability of power producers. The reason is that while power producers must pay market prices for their inputs, their selling prices remain fixed by the state. The problem is coming to a head in the coal industry, where soaring coal prices is leading to power producer red ink. This issue bears watching. Efficient growth in the Chinese economy may well hinge upon it. At the same time, China has been looking to establish carbon trading. One of the first places this may be tried is in Guangdong, which plans to start up a cap-and-trade market within the next 3-5 years. As this occurs, marketplace measures can help alleviate the tension between economic growth and reducing carbon emissions by placing prices on carbon that will send appropriate price signals. Over time, China could become the northern market for carbon trading, with Singapore handling carbon trading in Southeast Asia. This would mirror the likely arrangements for operational management of a Pan-Asian Energy Infrastructure. Given that China is investing heavily in ‘next-generation’ electricity transmission systems such as Ultra-High Voltage Direct Current (UHVDC) power lines, this speaks directly to China’s industrial strengths. Domestically, this will prove most crucial in areas like Inner Mongolia and Xinjiang, where exploitation of wind resources has been stymied by the electricity grid’s inability to deliver the power to urban markets. It will also be important in the southwest, where hydro assets such as the Three Gorges Dam are now connected to cities using HVDC technology. Given China’s pioneering role in UHVDC technology, it could become a key equipment supplier to the electricity-transmission portion of a Pan-Asian Energy Infrastructure. Already, China is looking abroad. For instance, State Grid Corp. has signed a long-term agreement to run the Philippine electricity grid and has bought utility assets in Brazil. Separately, China already engages in a small amount of hydro-power trading with the Mekong States. This represents one of the few instances in all of Asia of cross-border electricity trading, and this kind of trading can be expected to grow in coming years. A Pan-Asian Energy Infrastructure could traverse China either by land or by sea. If by land, a Pan-Asian Energy Infrastructure could enter China through the Mekong States. China already conducts a small amount of cross-border electricity trading with the region. dramatically. This could be done through building much higher capacity electricity transmission capacity between the Mekong States and China’s southern electricity grid nexus in the city of Kunming. If by sea, it could enter China through pipeline and power line infrastructure built to serve offshore Joint Development Areas in the Tonkin Gulf and off Vietnam and the southern Chinese island of Hainan. In southern China, the primary renewable energy source is hydro. China’s hydropower flagship is the massive Three Gorges Dam, the world’s largest hydropower project. But the Three Gorges Dam isn’t the region’s only hydro asset. Other dams in the Mekong States and China total roughly 40,000 MW of capacity. Taken together, including pumped storage, southern China and the Mekong States have nearly 70,000 MW of rapid-response hydro capacity at their disposal. It is a huge resource. In addition, China plans to build another 70,000 MW of hydro capacity in its south and west. Hydro, however, is environmentally destructive. Therefore, its future development should be carefully minimized. Given this, not all the new capacity planned may be built. Already, some dams slated for development upstream of the Three Gorges Dam are attracting community opposition. Despite this, some of this capacity will get built. Some new environmental damage from new hydro inevitable. The key, then, is to get the greatest value in return for the environmental harm. If the hydro capacity is built and if Asia moves ahead with deeper electricity grid interconnection — this large-scale, environmentally-destructive hydro resource can still play a valuable economic and environmental role. That role would lie in using the hydro resource primarily to ‘load-balance’ intermittent renewable energy. This, instead of providing base load power. Given that Southern China now faces power shortfalls due to drought-induced lower hydropower output. As a result, an interconnected regional grid can allow China to diversity its base load energy sources and keep its hydro assets in reserve. Or, if water releases were required for drought alleviation needs even if the power weren’t needed in China, the electricity produced by the release could be used by neighboring countries or ‘stored’ in the ‘interconnected’ network, creating a ‘zero sum’ in terms of energy production. China leads the world in developing pumped storage facilities. Three 2,400 MW facilities are already operational just outside Hong Kong, in Guangdong, Guangzhou and Huizhou with a fourth, smaller facility of 1,800 MW in Zhuhai. Along with hydro, it’s hard to overemphasize the potential for pumped storage to play a valuable role as energy ‘batteries’ in a Pan-Asian Energy Infrastructure. These can be integrated into an entire Asian grid in which short-term fluctuations are handled by large traditional batteries, then hydro, then pumped storage, then natural gas — all within a 30-minute window. This would have to be coordinated with the dam’s other major role of flood control in southern China. But the two objectives are not mutually-exclusive. A Pan-Asian Energy Infrastructure passing through the South China Sea could connect to China at the southern port of Guangdong. This port could become, in essence, China’s ‘Houston,’ ie a huge energy import and export port. China is already building a 60-billion cubic meter per year natural gas hub in Guangdong Province to import natural gas by land by pipeline from as far away as Turkmenistan, as well as provide domestic distribution for Liquid Natural Gas delivered by sea from Australia, Indonesia and the Middle East. Guangdong already is the landing point for an 800-kilometer offshore pipeline from China’s own Yacheng offshore gas field south of Hainan Island. Finally, China is actively building out large-scale HVDC links to meet the growing electricity needs of Hong Kong, which already is a nexus for international fiber optic connections. Given the above, China already is building out a domestic energy infrastructure well-suited for integration into a Pan-Asian Energy Infrastructure that would increase redundancy and supply security for China’s huge economy. Central China is an important generation, transportation and consumption zone for energy. It could become a major transitway for a Pan-Asian Energy Infrastructure. Central China is home to many of China’s coal-fired power plants. It’s also where China’s nuclear industry is concentrated. Finally, central China lies between Southeast Asia and Northeast Asia. This makes it an ideal energy crossroads. In this respect, Chungking, Shanghai and Beijing could become the nodes of an intricate skein of energy flows coursing through an interconnected network encompassing Tokyo and Seoul. A large proportion of China’s population lives in central China. The region accounts for much of China’s economic growth. Westward-moving equatorial trade winds are channeled northeastward along the Chinese coastline back toward Alaska and the US West coast. As a result, the South China Sea, the Chinese coastline and the East China Sea have huge wind resources close to population centers that can be developed. As Europe develops an offshore wind industry in the North Sea, that expertise can be advantageously applied to Asia. Emerging Energy Research (EER) predicts that Sweden, Germany, the Netherlands and Belgium will be the world’s most attractive wind markets between now and 2014. From 2014 to 2020, EER forecasts the United States, China and Korea will follow Europe in aggressively developing their own wind markets. Natural gas pipelines and HVDC electricity cables making landfall at Hainan Island and/Hong Kong can be extended northward along the Chinese coastline to deliver natural gas and electricity to Japan and South Korea. An infrastructure like this also would be ideally suited to developing offshore areas for wind development, offering significant opportunities to share infrastructure. Over time, Shanghai could emerge as a major regional offshore wind hub, adding to its existing role as major maritime center. China has one of the world’s oldest functioning tidal power stations. This is the 3.2 MW Jiangxia station south of Shanghai. China also is planning another station on the Yalu River bordering North Korea in Northern China, although not much has been heard of the project since 2004. China also is building pumped storage capacity. This can be used for localized grid ‘load-balancing’ with rapid response electricity. Many of central China’s pumped storage facilities are located around Shanghai. Others are located near major electricity consumption centers such as Hong Kong. An example of the command and control role that Central China can play is the 1,800 MW pumped storage facility at Tianhuangping, which now provides load balancing for the region. Shanghai occupies a geographic location in northern Asia akin to that occupied by Singapore in Southeast Asia. Over time, Shanghai could become a major North Asia trading, distribution and management nexus for a Pan-Asian Energy Infrastructure. A Pan-Asian Energy Infrastructure, regardless of whether it went by land or by sea, would logically pass through Shanghai. A lot of marine construction and maintenance equipment (such as cable-laying ships) is based in Shanghai, so it could become a dispatch center for offshore maintenance and repair. Following Japan’s March 2011 earthquake, Shanghai-based multipurpose marine repair vessels headed for the waters off Honshu. Thanks to these ships, Japan’s severed fiber optic connections to the world were largely repaired within weeks. Most of these marine repair ships are multipurpose vessels, and can be equipped to lay and repair HVDC cables and marine pipelines as needed. Separately, Shanghai is now China’s main hub for development of offshore wind power. Several projects are located in the near-shore waters around the city, and other projects are planned. With the added benefit of transmission infrastructure across the East China Sea to Japan and South Korea, China can develop this potential further. A Pan-Asian Energy Infrastructure can help China better manage both its domestic energy needs and those of its neighbors and trading partners through energy imports and exports. In this respect, Shanghai could play the same kind of clearing and trading role for Northeast Asia that Singapore can play for the ASEAN states and Australia. In addition to its potential as an energy transport conduit and wind-generating resource, the East China Sea also has oil and gas reserves. Near Hong Kong, China is already developing the Yacheng Field, connected to Hong Kong over an 800 kilometer pipeline. Other promising fields in the region include the Pacheco Field off Taiwan and the various oil and gas fields in the East China Sea. Northern China has sun and wind. It also can expand cross-border interconnections with Mongolia and Russia to import wind and hydropower. Wind is the most promising of Northern China’s renewable energy resources. China’s northern wind resources, along with those of Siberian Russia, are sufficient to power the country several times over. By 2015, China plans to quadruple its installed wind power capacity between 2010 and 2015, and then nearly double it again by 2020. This presents two challenges: developing the resource and getting it to market. Already, wind farms are being developed in the north. But limited grid interconnections means much of this capacity is wasted. But as China invests in developing its northern wind resources and expanding grid access in the region, increasing amounts of wind energy from the region can be expected to flow into the national grid. China has targeted its northern and coastal regions for a major wind power expansion, aiming for up to 10GW of capacity to be brought online through seven strategic development areas by 2020 at a cost of about $150 billion. In addition, Inner Mongolia and northwestern Jilin Province have been named as among key locations around the country for aggressive development of wind energy. Northern China, Inner Mongolia and Mongolia all receive high levels of direct normal radiation, the kind best suited for concentrating solar power. However, all three regions are mostly located above 35 degrees north latitude. This is a drawback. That’s because the lower sun angle at higher latitudes negatively affects solar thermal field performance. Nonetheless, several large-scale solar projects are slated for construction in northern China. The American company First Solar plans to build a solar photovoltaic farm eight kilometers on a side near Ordos City in Inner Mongolia by 2019. When built, it will be one of the world’s largest solar farms, eventually reaching a capacity of 300 MW. That, in turn is part of a larger effort to build out capacity of as much as 11,950 MW farm in the region. Elsewhere, a joint venture between Norway’s Scatec Solar and China’s Sahne Group plan to build out 2.5 GW of solar energy in Northern China by 2016 under China’s Golden Sun Program. The pair plan to build a green energy farm in Taonan in Jilin province that will include 100MW of wind and 5MW of solar PV. Meanwhile, California-based eSolar has committed to investing $5 billion to assist Chinese manufacturers develop a solar-thermal manufacturing base in Yulin, Shaanxi. While small in relation to the hydropower potential of southern China, northern China does have some hydro power assets it can exploit, both domestically and in neighboring North Korea and Russia. For instance, China has built some smaller dams along the Yalu River which borders North Korea. More are planned. Over time, projects like these could open the way for further connections across North Korea to South Korea. This could help progressively integrate North Korea into the Asian economy as part of political and economic reforms there. A 2004 study by the Tokyo-based Asia Pacific Energy Research Center (APERC) suggested Russia’s Far Eastern hydro resources could be harnessed to provide electricity to China and Japan over High Voltage Direct Current power lines, some of which could traverse North Korea. In the report, APERC suggested HVDC cables stretching from northern China into Russia’s Far East could deliver Russian hydropower to meet the summertime air conditioning needs of cities like Shanghai and even Japan and South Korea. The APERC argued that since Russia’s peak electricity needs occur in winter for heating, and Japan and South Korea’s peak energy needs occur in summer for air conditioning, Russian hydropower could flow south in summer and Japan and South Korean nuclear power could flow north in winter. These aren’t the only big visions for northern China. For instance, Japanese telecommunications magnate Masayoshi Son has proposed an East Asian Super Grid that would connect Mongolia to northern China, South Korea, Japan and Southeast Asia. For its part, the Tokyo-based Asia-Pacific Energy Research Centre has proposed power lines stretching from southern Siberia to China, Japan and South Korea to deliver hydropower. Taiwan could develop wind power resources in the Taiwan Strait as well as in the ocean area separating it from the Philippines. It could also provide a staging point for large-scale development of ocean thermal energy conversion. Given this, Taiwan could represent an important additional leg of a Pan-Asian Energy Infrastructure between the South China Sea and Northeast Asia. Unfortunately, to date Taiwan has done little to encourage renewable energy, offering only small incentives to produce it and only token efforts to encourage such leading edge technology as ocean thermal. This has led to a paucity of investment. Good wind resources exist in both the Taiwan Strait and to the east and south of the island. By 2025, Taiwan hopes to have 2,000-3,000 MW of offshore wind capacity in place, enough to satisfy about four percent of domestic demand. In total, Taiwan is aiming at renewable energy satisfying 15% of national electricity needs by that year. With its expertise in microchips, Taiwan could develop high-technology solar photovoltaic technology, particularly concentrating solar PV. Taiwan’s primary renewable energy resource is hydropower, with some pumped hydro resources. Taiwan also makes use of a small amount of biomass power. South of Taiwan in the ocean area separating the island from the northern Philippines could be a major area for development of renewable energy. Taiwan already has plans to build its first offshore wind farms by 2015, and the island’s desire to diversify its energy sources could lead to development of more offshore wind power. The first manifestation of this may be a huge 600 MW offshore wind farm announced by a Taiwanese and a Scottish company. The wind farm would be situated in waters 30 meters deep, 2.5 kilometers offshore. Ultimately this could mark the first steps toward Taiwan and the Philippines working together to develop the offshore wind resources and ocean thermal energy potential lying between their two countries. A string of islands lie between the two countries that could offer the ability to create an HVDC link between Taiwan and the Philippines into which wind and ocean thermal energy could be fed. The deep ocean areas to the east and south of Taiwan are among the best in the world for development of Ocean Thermal Energy Conversion (OTEC). The reason is that depths drop off quickly as close as three kilometers offshore Taiwan and similar dropoffs occur all along the island chain between southern Taiwan and the main Philippine island of Luzon. Cross-border energy market integration could transform the East China Sea into a regional energy hub. It would do this by interconnecting the energy economies of China, Japan and South Korea with high capacity power lines and natural gas pipelines. These would supplement the already-dense numbers of fiber optics cables across the sea that have delivered the telecommunications revolution. A Pan-Asian Energy Infrastructure would traverse the East China Sea in two ways. The first would be via a combined electricity/natural gas pipeline from Shanghai to the median line between China and Japan. It would then follow the line north before turning northeast along the Japan-South Korea median line. There it would split off to Pusan, South Korea and Japan’s Fukuoka Province. The second route would come by sea from the Taiwan Strait separating China from the island of Taiwan. The East China Sea: Energy Hub? While acrimonius offshore territorial spats between China, Japan and South Korea dominate headlines about the East China Sea – these obscure a previous history of cooperation. For instance, Japan and South Korea have had a Joint Development Area in the East China Sea for decades now. In 2012, China and Japan agreed to negotiate an adjacent one. In addition, China, Japan and South Korea have agreed to negotiate a free trade agreement. A free trade agreement coupled with expanding joint development areas could open the way for collective development of a common-carrier energy and data infrastructure across the East China Sea. All three countries would gain. For China, it would enhance redundancy in a domestic energy network reliant on West-East and North South domestic energy transfers. For Japan, it would reduce vulnerability to energy supply disruption. This vulnerability was brutally illustrated by the 2012 Fukushima earthquake and tsunami. For South Korea, it would create a ‘demand-pull’ opportunity to develop and export wave and tidal energy. South Korea has targeted ocean energy as a strategic domestic technology to develop. For all three countries, an East China Sea energy infrastructure would lay the foundation for energy market innovation. The result would be a virtuous circle of wealth creation, reduced greenhouse gas emissions and more stable international economic relations. The East China Sea may hold 60-100 million barrels of oil and 1-2 trillion cubic feet of natural gas, according to the US Energy Information Administration. The East China Sea Basin is the biggest prospective oil and gas area in the East China Sea. It lies roughly midway between Japan, China and South Korea. The East China Sea’s biggest piece of offshore energy delivery infrastructure is a 440-kilometer long oil and gas pipeline system connecting Shanghai to the Pinghu Field. Co-financed by Japan,. it was built in the early 1980s. The East China Sea’s festering territorial issues primarily revolve around China and Japan’s claims to Exclusive Economic Zones stretching 200 nautical miles from their respective land-based territory. However, when countries lie closer together than 400 kilometers (allowing each a 200 kilometer EEZ), one solution has been to draw a ‘median’ halfway between them. In recent years, agreeing to use this median line between Japan, South Korea and China has led to beneficial practical outcomes. In 1974, South Korea and Japan agreed to a Joint Development Area in the East China Sea straddling the median line between Japan and South Korea. The two countries have since drilled a series of exploratory oil and gas wells in the JDA. South Korea and China have been drilling separate wells in the area. In 2008, China and Japan agreed to negotiate joint exploration for oil and gas reserves in waters north of Taiwan. This area abuts an existing Joint Development Area agreed between Japan and South Korea. Both China and Japan stress that cooperation represents a practical means for developing the resources pending final solution of territorial issues. Elsewhere, Joint Development Areas have enabled neighboring countries to work together to develop offshore fields. Successful examples exist in offshore West Africa, the Middle East and elsewhere. Should the Japan-South Korea or proposed Japan-China JDAs yield economic oil and gas supplies, they will need a route to market. Given that the JDAs lie just south of the shortest route between Shanghai and the Japan’s island of Kyushu, a pipeline infrastructure could be built along the East China Sea median line. Spurs could be built as needed to other gas fields. A gas pipeline network, therefore, could be the first step toward building subsequent infrastructure to trade electricity between the three markets and share spare capacity. Over time, this infrastructure also could offer a route to market for more speculative energy sources such as ocean themal energy conversion (OTEC) and provide services to offshore aquaculture. East of the South Korean island of Cheju Do, the line could split off to Pusan, South Korea and Fukuoka, Japan. This would have the advantage of skirting unresolved territorial issues — as the JDAs themselves do — while enabling construction of infrastructure and exploitation of resources. For China and Japan, it would provide a larger infrastructure through which any finds in their proposed joint development area could be shipped. For Japan and South Korea, it would provide a trunkline for exploration and production in their Joint Development Area south of the median line. South Korea would gain the same benefits for its exploration areas north and east of its respective median lines with Japan and China. For China, it would enable pipeline spurs to be potentially laid down to other fields surrounding the Pinghu oil and gas field, pipelines which Japan helped build. The East China Sea has large renewable energy resources that an comprehensive, cross-sea electricity and natural gas infrastructure would help access. China has wind resources along its east coast, while both Japan and South Korea have wind resources along their west coasts. All three countries are developing these. South Korea has moved forcefully into developing the technology with the aim of becoming a world leader. China also has experimented with tidal power near Shanghai. Japan is experimenting with offshore solar farms, or ocean-floating platforms crammed with solar photovoltaic panels. These could similarly benefit from interconnection with an energy infrastructure spanning the East China Sea. Already, near-shore wind farms have been built just outside Shanghai and off of South Korea. These could march further out to sea in coming years, riding a wave of other infrastructure development such as natural gas pipelines and fiber optics. In the North Sea, the idea has been that Norway’s hydro dams could become the ‘battery’ for Europe. In the East China Sea, it could be seafloor compressed air sacs or even stored hydro from China’s west. 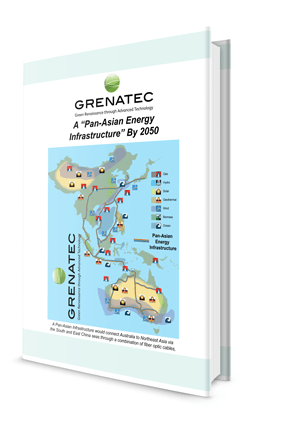 Grenatec is not alone in advocating electricity and/or natural gas pipeline interconnections between China, Japan and South Korea. The idea has a pedigree stretching back nearly a decade. This is just part of Son’s vision of an even This is just part of a larger vision of interconnecting Northeast Asia’s large economies with those of the ASEAN nations further south as part of an Asian Super Grid. The Germany-based Hans Seidler Foundation has suggested Mongolia and Inner Mongolia’s abundant wind and energy be harvested and delivered into the Chinese grid and eventually onward delivery to South Korea and Japan. In 2004, the Tokyo-based Asia-Pacific Energy Research Center (APERC) concluded deeper electricity grid interconnections between China, Japan and South Korea would benefit all three countries. In a detailed study, APERC concluded that excess electricity generating capacity could be efficiently shared between the three countries. The main reason was that northern China’s annual peak energy needs occur in winter for heating. Japan and South Korea’s annual peak energy needs occur in summer for air conditioning. If energy were included, multiple breakthroughs could occur at once. It could open the way for Chinese deployment of offshore HVDC for wind, wave and tidal energy. It could also open the way Japanese natural gas pipelines like those put in place for Pinghu. These in turn could part of larger market reforms in the three countries to increase efficiency in downstream energy markets and encourage competition. China is investing heavily in expanding its domestic natural gas pipeline network and negotiating deeper interconnections to it to both Russia and central Asia. These are ideally-situated for future interconnection to Japan and South Korea. Further east, the pipeline could connect with a sea-based Pan-Asian Energy Infrastructure coming up from the South China Sea. The benefits of that infrastructure would be multiple. At present, pipelines have been losing out on investment to large, expensive LNG plants that require alot of coastal infrastructure and are good for only one thing: compressing, uncompressing and shipping LNG. As energy markets evolve LNG will be viewed, in hindsight, as hugely wasteful. This is particularly so as markets progressively integrate and carbon pricing takes hold. The reason is that pipelines can carry hydrogen, biofuels and even waste carbon. This flexibility will gain in value in coming years, reducing the attractiveness and the long-term payback of LNG. But the biggest reason is that natural gas pipelines already have routes laid out for them across Asia and they can provide the second leg of a tripartite infrastructure that can include electricity power lines. As that occurs, hugely expanded energy market flexibility will occur as natural gas can be substituted for electricity as market reforms progressively shift the energy industry away from long-term contracts and more toward an open market governed by dynamic price signals. These reforms will benefit producers, consumers and the goal of reducing climate change by allowing the market to determine the best, low-cost, low-emission energy mix for Asia. Free Trade+Bundled Infrastructure=Transport or Transmit? Once Joint Development Areas and free trade agreements are in place, multilateral infrastructure could be the next step. This would create a more frictionless Northeast Asia regional energy market. With suitable interconnection, either natural gas or electricity could flow across the sea to all three markets. This would provide a major economic boost to all three economies through increasing supply security and lowering cost through greater competition. Under such a system, the lowest-cost, carbon-adjusted power sources would be dispatched first. These would likely be Chinese and Japanese wind energy, South Korean wave and tidal energy and Japanese geothermal. Uncorrelated regional intermittences would largely cancel each other out. Residual load-balancing needs could be met through rapid-response hydropower (seconds to minutes) followed by natural gas with prices further adjusted by congestion, distance and volume needed. Swiss HVDC cable manufacturer ABB has researched the cross-over point at which natural gas is cheaper to pipe to its final location than electricity generated nearer the upstream gas source. In an interconnected network, these kinds of calculations would influence the flow. ABB has calculated a crossover, but no one knows how this relationship will fare in the future. The ultimate backstop for supply would be sidelined coal-fired power plants made uneconomic by carbon pricing but still in good working order. These could be maintained in reserve to meet longer-term spikes in demand, such at seasonal demand peaks during heatwaves. Coal-fired power plants also could be used to make up shortfalls caused by, or instance, natural disaster knocked out lower-emission capacity elsewhere in the system. The East China Sea is where all the benefits of a Pan-Asian Energy Infrastructure come together. Deepening interconnection between energy networks and deepening international cooperation in energy trade will increase efficiency, lower energy market volatility, reduce geopolitical tension. It will also lead to a reindustrialization of the region around the industries of tomorrow. Best of all, it will pull the smaller economies of the region (ASEAN and Australia) along with it in a symbiotic relationship. An example of this is State Grid of China. It can build the region’s HVDC networks and operate grid infrastructure like South Australia’s Electranet, while Australia and other countries can sell premium priced solar, wind and hydro to a regnal grid dominated by renewables. This would not concentrate geopolitical risk. For instance, having State Grid build new electricity grids would be no more risky that having Chinese companies build toll roads. The infrastructure is immovable once built. Therefore, China has every incentive to keep the customer happy. Plus, as with a toll road, control over toll collection remains in the hands of the buyer. It may take years for Japan to get back on its feet following the March 2011 earthquake and tsunami. In the meantime, Japan must find replacement energy-generation capacity to replace that destroyed by the national disaster. Over the short-term, it’s most likely to occur through increased imports of Liquid Natural Gas (LNG) and hastily-built new natural gas plants. On the demand side, the country may suffer periodic regional blackouts for an indefinite period. Over the longer-term, Japan could increase energy security, and better insulate itself from economic and geologic shocks to its energy system through more aggressively developing its internal renewable energy resources while deepening electricity market and natural gas interconnections with China, South Korea and even Russia. This would include more aggressive development of domestic geothermal power, as well building pipelines and HVDC interconnections to other countries — mirroring the pathways already laid by fiber optic cables. In Japan, the same sources that unleashed the destructive March 2011 earthquake can also be used to generate electricity. Japan should expand its development of geothermal power. Japan is already a producer of geothermal power. It has long been a geothermal energy technology pioneer along with the United States and the Philippines. Japanese companies already lead the world in producing and selling geothermal energy technology. The geothermal resource in Japan is huge: 23,500 MW of hypothetical capacity, enough to replace a significant amount of its nuclear capacity. Just under half the nation’s geothermal plants are located in the area where Japan’s earthquake hit. While several shut down after the earthquake, none were significantly damaged, and virtually all were able to continue operating. This indicates how robust the geothermal energy source can be in a country as tectonically risky as Japan. Japan has about 2,000 MW of wind energy capacity installed. The most recent wind farm was a 20 MW project located on the Osumi Peninsula in Kagoshima. In 2010, a year before the devastating earthquake, government officials had been talking about developing massive offshore wind farms by 2020 with capacity equivalent to 10 nuclear power plants. These kinds of efforts may be speeded up. Like geothermal, wind may also provide a more earthquake-resistant form of energy production for Japan. For instance, the Kamisu wind farm 300 km from Fukushima took a direct hit by the March tsunami and continued operating. Japan is a country with selective excellence in engineering. This is exactly what Ocean Thermal Energy Conversion (OTEC) requires. Some companies in Japan have suggested building large barges that would be moored at sea to generate solar energy and wind. Others have been engaged in tidal energy and OTEC. Japan has a history in OTEC. It successfully trialled an OTEC plant in the Republic of Nauru in 1981. For instance, researchers at Tokyo Tech have developed the Asia ‘Pacific Sunbelt Development Project.’ This would entail using concentrating solar power generated from Australia’s Outback to create synthetic energy fuels shipped to North Asia by tanker or pipeline. The technology would be applied using a Japanese-developed ‘top down’ method of generating concentrating solar power now being trialled in Abu Dhabi. Elsewhere, there is the ‘Super Apollo Project.’ This proposes building large scale solar plants in desert areas that would create enough energy to create both electricity and to power manufacturing of solar PV cells from Sahara sand, creating a virtuous circle. Electricity grid recovery efforts in Japan have been slowed by Japan’s legacy grid architecture. This divides Japan’s electricity system into two halves. It limits the electricity sharing that can occur. As in the United States, which has three distinct grid regions, better interconnections need to be developed to create redundancy. Internationally, Russia’s Gazprom has indicated its willingness to step up exports of LNG to the island of Sakhalin to Japan to cover the Japan’s near term energy needs. However, with much of its port infrastructure damaged, Japan’s ability to step up LNG imports over the short-term may be questionable. Longer-term, Gazprom has indicated may lay HVDC cables from Sakhalin to Hokkaido to engage in electricity trade. Had such infrastructure been in place, increased imports of electricity could have been used to cushion the domestic ‘supply shock’ of lost generation capacity. Some of Japan’s LNG regasification facilities were heavily damaged by the earthquake, particularly in Sendai. These will take time to repair. South Korea enjoys emerging selective excellence in tidal energy and pumped storage. South Korea is seeking the high ground in tidal energy. This is due to its craggy southern coastline that allows the resource to be captured. For instance, the one megawatt Udolmok tidal power plant has been in operation since 2009. South Korea has plans to expand it to as large as 9 MW. The 254 MW Shiwa Power Station, once it comes on line, will be the biggest in the world. That should be followed by Sea Turtle Park, a 110 MW tidal park. South Korea is also building up wind expertise, primarily through building wind farms in and around its southern island of Jeju in the East China Sea off South Korea’s South Coast. South Korea has announced major support programs for renewable energy of just under $900 million, or about 1% of GDP. These are targeted at building up the nation’s renewable energy industry to expand South Korea’s exports in the industry 10 times over, to $40 billion, by 2015. One example of the targeted approach South Korea is taking is reflected in announcements such as that from Samsung that it will seek selective excellence in solar battery technology. South Korea also plans to begin a system of ‘cap-and-trade’ of carbon emissions by 2015. Finally, South Korea has taken an interest in encouraging green development in developing countries through such organizations as the Global Green Growth Institute, headed by former South Korean Prime Minister Han Seung-Soo. South Korea plans to spend $7 billion, or 0.8% of South Korean GDP by 2025 on smart grids for the small, densely-populated country. South Korea also has come up with creative ideas regarding cross-border electricity sharing in North Asia. One remarkable plan would involve transmitting electricity and/or natural gas across North Korea to South Korea and possibly Japan. Doing this, however, would require placing much confidence in North Korea’s willingness to abide by contracts, which only China can ensure. An Asian clean energy revolution requires better price signals that can ‘invert’ the dispatch order of electricity. That will enable the market to do the work of energy industry structural adjustment. In a regional system of harmonized carbon pricing and interconnected grids, low-emission energy sources will enjoy dispatch priority by virtue of a lower carbon-adjusted price value. Once the lowest marginal cost, low-emission power sources are exhausted, higher carbon price-adjusted energy sources will be dispatched into the grid until demand and supply are balanced. It’s all basic, textbook stuff. This would go on day and all night, all the time. In fact, it already does The only thing missing is the crucial carbon price signal –– the economic reform required for solving the market failure of climate change. As intermittent renewable energy sources come to dominate Asia’s ‘load stack,’ of dispatch order, cross-border grid interconnections will enable regionally-uncorrelated renewable energy intermittencies to cancel each other out. In financial markets this is known as a ‘natural hedge,’ or a negatively-correlated offset. Residual intermittency could be offset by electricity in storage (batteries, pumped hydro or hydrogen, for instance). These supplies would be ‘topped up’ by surplus intermittent power created during periods of low grid demand and stored instead of wasted. When those supplemental ‘battery’ reserves are exhausted, hydro power can be released. In Australia, the Snowy Hydro Scheme plays this role. This would be followed by natural gas. Indeed, most ‘peaking power’ plants are natural gas. Finally aging, fully-depreciated, sidelined coal plants kept online for peak power could provide the final backup supply. An example of this is South Australia’s Playford coal plant outside Port Augusta — the dirtiest in the country. Examples elsewhere include recent dought-related discharges of water from China’s Three Gorges Dam. Water releases from the dam in late May 2011 were undertaken to ease drought in the surrounding countryside, even though the water wasn’t needed for electricity production. That surplus electricity produced from the drought releases of water from the Three Gorges Dam could have been used to supplant electricity elsewhere in the system, or could have gone into storage for use later. Interconnection in the system allows this to happen. As such, a flexible system can take into account vicissitudes not directly related to immediate grid electricity needs. This flexibility is valuable. At present it isn’t valued. Stated conversely, the lack of interconnection between China and neighboring states meant much of the water release from the Three Gorges Dam in late May for drought reasons was left under-utilized for electricity production. That’s an inefficient use of the infrastructure. This cross-border ‘load balancing’ function is perhaps the most significant efficiency gain future interconnected grids can bring. This in turn will help future electricity markets better value the relative rapid-response qualities of various power sources. Once this under-pricing is eliminated, energy markets can function more efficiently in matching supply and demand. In markets like this, existing hydro and gas assets will be revalued upward. There will be three reasons for this. First, hydro and gas have rapid response times. Hydro-electricity can be generated and delivered to the grid within tens of seconds, natural gas within minutes. As intermittent renewables dominate the grid, this rapid-response quality of hydro and gas becomes increasingly valuable. This will be reflected in future pricing. Second, hydro and gas are both low-emission energy sources –– hydro more so than gas. Third, disincentives exist to future large-scale investment in hydro and gas. For their part, hydro plants take a long time to build and are environmentally contentious. For its part, natural gas by all accounts is merely viewed as a transition fuel to renewables. It’s commercial longevity doesn’t stretch beyond the medium term. Taking all the above together, existing hydro is rapid-response, zero-emission power with a declining likelihood of huge new capacity coming on line. For its part, natural gas is a less-rapid response (but still fast) power source with medium-level emissions, albeit with a likelihood of additional medium-term supply coming on line. Once proper carbon, rapid-response and future scarcity price signals are applied, hydro is likely to be a more lucrative form of load balancing power than natural gas, even though both will prosper through premium pricing over the medium term. However, the most important element in this analysis is that both will do well because their qualitative attributes will be better valued in a reformed market that better differentiates between the environmentally and operationally qualitative aspects of competing power sources. These can be installed just about anywhere. They can operate on the micro, intermediate or macro level. On the micro level, lithium-ion batteries have been attached to individual wind farms to better even out their electricity load contribution to existing, dumb grids. At the intermediate, urban level, other battery projects, for instance around New York City, are being built to handle fluctuations in the larger grid. At the grid level, State Grid Corp. of China is developing large-scale sodium sulfur batteries. Pumped storage, something else China is building, can operate at the large-scale, macro level. All of the above technologies, and others, will compete in the energy networks of the future, leading to experimentation, competition, innovation and better energy market efficiency. Carbon pricing and interconnection are the key enablers. Carbon pricing prioritizes low-emission energy dispatch, while interconnection enables temporal premiums on rapid-response ‘load balancing’ power to fund investment in standby supply. The result is lower prices, greater grid stability and reduced carbon emissions. Some are arguing lithium ion batteries could be competitive for short-term dispatch as early as 2016. China already has a large-scale battery technology operating in Heibei Province. Compressed air uses underground structures like salt caverns to store air under pressure. The air can be quickly released to generate electricity. Most compressed air sites are in the United States, but others could be constructed in Asia. Pumped storage is still in its infancy. China has built several pumped storage facilities near its eastern cities and has plans for more. An example of pumped hydro at work is the Norned cable between Norway and Holland, a perfect microcosm of how renewables (like wind) and ‘load balancers’ (like pumped storage) can work. With Norned, stored hydro power in Norwegian dams is released to the Netherlands to meet Dutch daytime peak energy demand. Dutch coal-fired power then powers both countries at night when demand is low. Norned has been such a success there are now plans to lay a similar cable from Norway to the UK to enable Norwegian hydropower to offset UK wind power, and potentially another to France. Over time, Asia’s hydropower resources could be repurposed to providing peaking and load-balancing power. This would put them to their best use in future grids as a rapid response source of marginal power. In Germany, for instance, old coal mines are being studied for their ability to hold water in innovative pumped storage projects. Natural gas requires only about 20 minutes to start providing large-scale electricity from a cold start. Anticipating new markets, global companies like General Electric are developing large-scale gas turbines with the ability to turn on and off efficiently. These turbines are being developed in anticipation of growing markets for natural gas to play an emerging role as major load-balancer in grids. There’s also an installed base of natural gas plants in Asia, and a growing number of new gas fired power plants being built to tackle near-term energy needs. These new and existing plants can be used for base load over the short- to medium term to replace the region’s dirtiest coal fired power plants (such as those in Australia’s Victoria, near Indonesia’s Jakarta and in China’s interior).They can then be repurposed to providing load-balancing over the long-term. This will create greater market certainty about the marketplace longevity of this particular source of power. That, in turn, should raise confidence for investment in it over the medium term. Coal still has a long-term role in a future grid dominated by renewables. That’s because energy assets are long-lived, and take a long time to build. Given this, aging coal-fired capacity with some useful life left can be taken offline for base load purposes and kept in reserve for contingency use. It can then be brought on line within 8-10 hours if needed to help meet demand from weather events such as heatwaves and geological events such as earthquakes that knock out capacity elsewhere. Energy trading will reduce peak levels through creating incentives and disincentives through the price mechanism for peaks and troughs in grid demand to occur. It will also tend to levelize prices in different markets as efficiencies take hold. This will save both money and emissions over the long-term through better price signaling. The above has outlined how interconnected grids can share power across regions, enhancing efficiency. But another frontier also beckons, and that’s localized power production that reduces demand on the grid. This can dramatically reduce the amount of interconnection needed between markets, lowering large-scale infrastructure costs. An example of this is a proposal for Australia’s largest city, Sydney, to generate much of its power locally, eliminating the need to draw electricity from far away energy sources via the grid. Hydrogen could be the successor fuel to many of the load-balancing devices above. That’s because it can generate energy quickly and is a storage vessel for energy. One place to look for innovations may be the American state of Hawaii, now totally dependent on imported energy. On the densely populated island of Oahu, a series of companies is working to use existing gas pipelines around the island for distributing hydrogen. Such small-scale applications could lead to bigger things over time. California is similarly building out a series of hydrogen vehicle refueling stations along major roadways in the state. California is a much bigger place than Hawaii. In addition, the pace of research is picking up in how to develop hydrogen from a series of sources ranging from sunlight to algae. The reason that building out natural gas pipelines make much more sense for Asia than LNG for transport of natural gas is that pipelines are inherently more flexible than LNG technology. That makes them more flexible to repurposing to future uses. Hydrogen is one of those uses. Current natural gas pipelines can carry up to 20% hydrogen. Future natural gas pipelines, constructed with the future in mind, could carry even larger amounts of fuels such as hydrogen. Another fuel that could flow across natural gas pipelines in the future is bio-gas. This is a form of natural gas derived from biological materials, and is already being distributed to customers in Canada’s British Columbia over natural gas pipelines. Over the short-term, artificially high feed-in tariffs make sense. Over time, these should be wound down and replaced with carbon pricing on electricity sources. This will cause a smoother glide path to differentiated pricing between energy sources. Demand curves vary throughout the day. Afternoon/early evening power is more valuable than overnight power. At present the system doesn’t take sufficient account of this. Distance-adjusted pricing will help any marginal demand to be satisfied by the nearest available source of marginal supply. Over time, given greater efficiency, this distance adjusted cost will shrink. There are three kinds of power relevant for grid management: base load, peaking power and intermittent. “Base load’ power is provided by energy sources like coal and nuclear. They need to be run all the time or they lose efficiency. ‘Peaking power’ is energy needed to meet higher demand that occurs at particular times of day or weather conditions: such as late afternoon or high summer. ‘Intermittent energy’ is produced by renewable energy sources like sun and wind. Their output won’t necessarily match grid demand, and so either needs to be stored or wasted. Any effective pricing mechanism for a future regional interconnected grid needs to apply discounts or premiums to the various energy sources available reflecting their marginal value in meeting fluctuating demand. On Dec 11, 2011, 194 nations agreed in Durban, South Africa to negotiate — by 2015 — a binding multilateral agreement to come into force in 2020 to cut global greenhouse gas emissions significantly by mid-century. Time is short. Ideas and solutions are needed. One way to achieve massive multilateral reductions in greenhouse gas emissions is to create undistorted markets in which trade can flourish and price signals be properly transmitted. Carbon-pricing and cross-border energy networks can create this environment. And this brings the issue back — squarely — to infrastructure. Asia needs infrastructure not just to battle climate change but to continue its wealth-creating economic growth as it becomes the world’s largest economic bloc. As Asia builds out new infrastructure, much of it for the first time, the region has an opportunity to ‘think different,’ unhindered by legacy technical standards and mental millstones. The template is the telecommunications revolution. Over the past 20 years, a period well within the living memory of most people, the telecommunications revolution has vastly improved all of our lives. It has created not just economic riches and new industries, but opened up new intellectual horizons for all of us due to easier access to a broad range of information. The telecommunications revolution was brought about through hardware (fiber optics), software (the Internet protocol) and more open markets (cross-border interconnection). That same revolution now needs to be applied to energy. Already, the energy revolution is picking up speed. High-Voltage Direct Current power lines are being increased deployed. In Asia, this is most notably happening in China, which is making massive investments to expand the long-range carriage of electricity across its vast hinterland. That’s the hardware. In software, the ‘smart grid’ is all the rage. This term broadly encompasses both long-haul electricity carriage and local distribution. But everyone agrees the current system is wasteful: only about 30% of electricity from the average power plant reaches the wall socket of the user. There are huge efficiency gains to be made in everything from transmission to demand management to energy storage. In terms of more open markets, the Association of Southeast Asian Nation states and the European Union are leading the way. The ASEAN states have their Trans-ASEAN Electricity Grid and Trans-ASEAN Gas Pipeline projects, and the Europeans have their program to create a single EU energy market by 2020. This can provide templates, good and bad, for others to analyse in opening up cross-border markets elsewhere. It all points to a big, long boom. Grenatec estimates, based upon existing comparable projects elsewhere in the world, that a bundled HVDC, natural gas pipelines and fiber optic cables capable of serving 20% of the region’s energy needs can be built for a highly-manageable cost. This is particularly so if built out over 40 years in region growing economically at a rapid pace and which needs the infrastructure anyway. At present, Asia emits roughly 9.5 billion tonnes of carbon dioxide, or about one-third the global total. The needed annual investments in infrastructure outlined above could be paid with carbon prices well within the range of what’s been suggested by multilateral agencies and imposed by forward looking managers of progressive economies.